Information about the slain interpreter was not available. WASHINGTON — A U.S. government aid worker killed in a suicide attack in Afghanistan was a former master planner for Prince George’s County. Forty-three-year-old Ragaei Abdelfattah was killed Wednesday in the eastern Kunar province along with three coalition service members and an Afghan civilian. The Washington Post (http://tinyurl.com/8ow2c7k ) reports that Abdelfattah was a native of Egypt and a naturalized American citizen who came to love the United States. He was married and had two teenage sons from a previous marriage. In addition to his work for Prince George’s County, Abdelfattah spent five years with the Maryland-National Capital Parks and Planning Commission. His wife, Angela Ruppe, says Abdelfattah was fulfilled by the development work he was doing in Afghanistan. A suicide bomber in eastern Afghanistan killed three troops, a U.S. aid worker and an Afghan interpreter on Wednesday, CNN reported. According to the Department of Defense, the attack occurred when an insurgent detonated a suicide vest in Sarkowi, Kunar Province. Army Command Sgt. Maj. Kevin J. Griffith, 45, the senior enlisted soldier of the 4th Brigade Combat Team, 4th Infantry Division from Fort Carson, Colo., died in the explosion. Also killed were Army Maj. Thomas E. Kennedy, 35, of West Point, N.Y., Air Force Maj. Walter D. Gray, 38, of Conyers, Ga., and USAID Foreign Service Officer Ragaei Abdelfattah. Several troops were also injured in the attack, but details were not released. A 24-year Army veteran, Griffith had been deployed to Afghanistan in March after serving three tours in Iraq. He was posthumously awarded a Bronze Star and a Purple Heart, the Casper Star Tribune reported. Kennedy joined the Army in 2000 and also received the Bronze Star. At the time of his death, he was serving on his third deployment, including two tours in Iraq. Gray was an Air Liaison Officer and flight commander attached to Fort Carson through the 93rd Air Ground Operations Wing at Moody Air Force Base, the Colorado Springs Gazette reported. Although commissioned as an officer in 1997, he was previously an enlisted Airman and one of the Air Force’s first career Air Liaison Officers. Abdelfattah recently began his second voluntary tour in Afghanistan to continue supporting the country’s stability and long-term development. “With the work of people such as Ragaei, the civilian surge we launched in Afghanistan in 2009 has made a tremendous impact, strengthening the capacity of the Afghan Government and laying a foundation for long-term sustainable development. Though we are shocked and saddened by this loss and will miss Ragaei, our efforts will continue,” Secretary of State Hillary Clinton said. 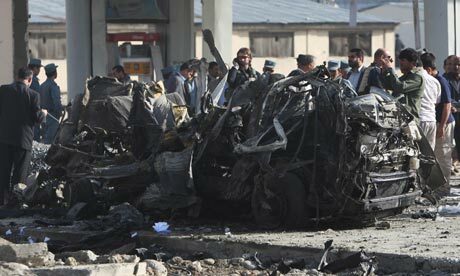 WASHINGTON — The Obama administration says a U.S. government aid worker was killed in a suicide attack in Afghanistan. Secretary of State Hillary Rodham Clinton condemned Wednesday’s attack by two men wearing suicide vests in the eastern Kunar province. Clinton’s statement said USAID foreign service officer Ragaei Abdelfattah, three coalition service members and an Afghan civilian were killed. A State Department diplomat was injured. American contractors risk losing business under a U.S. plan to double the share of international aid awards given to overseas entrepreneurs and governments. The U.S. Agency for International Development awarded $2.12 billion, or 15 percent, of its foreign assistance budget to the overseas groups last fiscal year, compared with $1.94 billion, or 12 percent, in fiscal 2010. The agency has set a goal of spending 30 percent of that aid on such entities by 2015. The shift may reduce awards to U.S.-based contractors, which received 59 percent of USAID’s $14.5 billion in foreign assistance spending in the fiscal year that ended Sept. 30. The remaining 26 percent went to other institutions, including universities and vocational schools. Rajiv Shah, the agency’s administrator, says boosting direct investment in developing countries will save money and strengthen foreign institutions. “We became far too reliant on contractors,’’ he said in a March 7 speech. The agency wants to work with local entrepreneurs and developing countries’ governments “instead of costlier Western consultants and contractors,’’ Shah said. That, in turn, threatens a vital part of the Obama administration’s plans for Afghanistan, which envision a continuing development mission after the end of the NATO combat mission in 2014. The main U.S. foreign aid agency is preparing to switch from private security contractors in Afghanistan to Afghan government-provided security this month under a new policy mandated by Afghan President Hamid Karzai, raising concern in Washington that this could put U.S. civilians at greater risk. U.S. Agency for International Development Administrator Rajiv Shah says the agency may be able to negotiate waivers from the policy for some major infrastructure projects so that they could continue to have access to private security. But U.S. AID officials also said this week that only 25 percent of U.S.-funded development projects in Afghanistan require security guards, suggesting the changeover to Afghan government-provided security this month that Karzai has ordered may not be so dramatic. “Seventy-five percent of our assistance portfolio does not require private security contractors today. So a lot of our partners, and a lot of the way we are doing business is not affected by this at all,” Alex Thier, Shah’s assistant for Afghanistan and Pakistan programs, said in an interview. Private security contractors working for foreign companies, who have numbered in the thousands, are no longer allowed on aid and development programs after March 20 under Karzai’s decree. If these programs want armed escorts or guards for their compounds, they are supposed to contract with a branch of the Afghan police, the Afghan Public Protection Force (APPF). Karzai has long been critical of private contractors and other “parallel institutions” in Afghanistan and wants them under the control of the Afghan government. Yet it’s far from clear that the Afghan Public Protection force can provide the same level of security. Update: An Albanian soldier was killed, and three other troops were injured, including two Albanians and an American, according to the provincial government in Kandahar, where the shooting took place. TIRANA, Albania – Suspected Afghan police opened fire on Albanian and other foreign troops in the war-wracked country’s south Monday, killing two Albanian soldiers and prompting the arrest of 11 Afghan policemen, authorities said. The deaths were the first for Albanian troops in Afghanistan. Another international soldier was wounded. The shootings appeared to be the latest in a growing number of attacks by Afghan police or army soldiers on foreign forces, a trend that has raised concerns about the vetting of Afghan recruits and threatened the international military commitment to the country. Last month, France suspended its training program and warned it may withdraw its forces a year ahead of schedule after an Afghan soldier shot and killed four French soldiers. Monday’s shooting occurred in the village of Robat, in the southern district of Spin Boldak near the Pakistani border, Kandahar police chief Abdul Raziq said. The troops were accompanying a USAID team for a meeting about opening two schools and a health cente, Albania’s defence ministry said. The prosecution could hardly have been better designed to provoke an American backlash. Although the charges against the 19 Americans are part of a broader crackdown on as many as nine nonprofit groups here, its most prominent targets are two American-financed groups with close ties to the Congressional leadership, the National Democratic Institute and the International Republican Institute. Both are chartered to promote democracy abroad with nonpartisan training and election monitoring. CAIRO — Egypt’s military-led government said Sunday that it would put 19 Americans and two dozen others on trial in a politically charged criminal investigation into the foreign financing of nonprofit groups that has shaken the 30-year alliance between the United States and Egypt. The decision raises tensions between the two allies to a new peak at a decisive moment in Egypt’s political transition after the ouster of President Hosni Mubarak a year ago. Angry protesters are battling security forces in the streets of the capital and other major cities. The economy is in urgent need of billions of dollars in foreign aid. And the military rulers are in the final stages of negotiations with the Islamists who dominate the new Parliament over the terms of a transfer of power that could set the country’s course for decades. 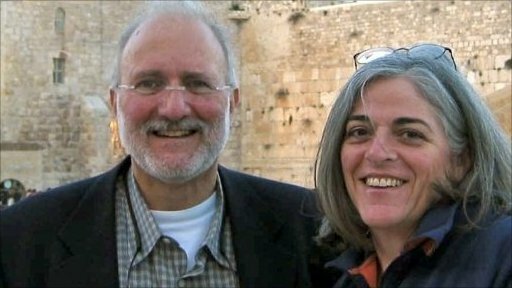 A kidnapped American aid contractor is alive and in good health, being held by a Pakistani Al Qaeda affiliate that’s likely to use him as a bargaining chip, according to militants, security officials, and analysts. “He is being provided all available medical treatment, including regular checkups by a doctor and the medicines prescribed for him before he was plucked,” the militant, who spoke only on the condition of anonymity due to the sensitivity of the issue, said last week in an interview. Little has been revealed publicly about Weinstein’s status since December, when Ayman al Zawahiri, the head of Al Qaeda, said in a video that the terrorist network was holding him. Weinstein, who’s from Rockville, Md., spent several years as the Pakistan country manager for J.E. Austin Associates, a contractor for the US Agency for International Development. Reportedly in ill health, he’d packed his bags and was within hours of leaving Pakistan for good on Aug. 13 when militants kidnapped him from his home in the affluent suburb of Model Town.